Words fail me. And that's not like me. Fantastic reds in your photos, Diane. I enjoyed your tour of WA a lot. Okay, I shall zip over there right now. Thoroughly enjoyable and entertaining Diane! Your photos are great, as always, and I loved your commentary. RED's interview style went down a treat. Thank you, I shall be a frequent visitor to her site too. Cheers! I saw you there yesterday. (You can run but you can't hide!) Loved the post. You did a great job Diane! I enjoyed seeing that Super Pit image once again. It's hard to imagine. I somehow missed the red water so I'm glad you included it. Amazing color! AMAZING images & interview - I'll have to hit you up for some photos to paint from! Well done and hearty congratulations! What a joy these photos are Diane, love them in collage form. I'll pop over to Red Oz' blog now. Thanks for the link and have a great weekend. Diane, I enjoyed your interview and your beautiful photos. Well done and congrats! I enjoyed reading your interview and seeing all your beautiful red hused photos of Western Australia, Diane! They were spectacular! Thanx Diane - and to your readers for their visits and lovely comments! It was a pleasure interviewing you - if there's anyone out there with RED photos to share with the world, let me know!!! 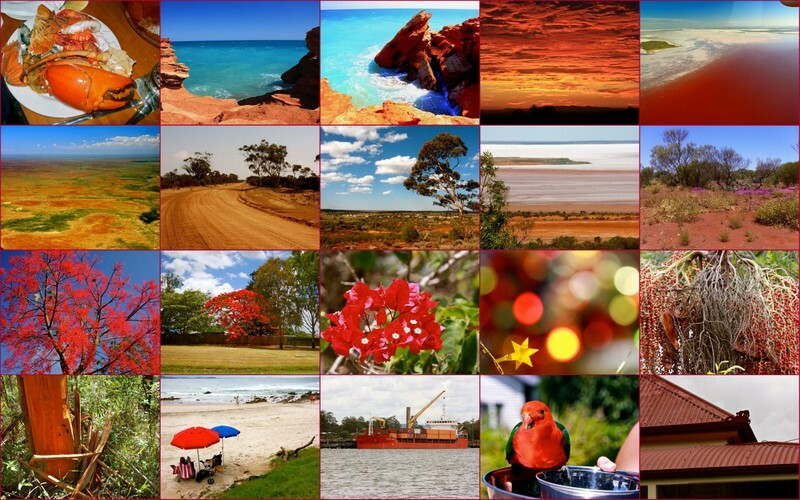 I love the collage - and your red photos are certainly very colourful. Australia - and Australians - are not the shy retiring type!